Join Aaron Ackerson, Dancing Hitler, and the hideous jabbering head of Hank Hill (among other kooky characters) for a few rounds of nobody's favorite video-game-franchise-based word game: Pokemon Sandwich! Kondo wa Pokemon Sandwich de asobou ka! Pikachu Kairyuu Pikachu Hey! Hasamimasho? Kairyuu Kyatapii Kairyuu Hey! Hasamimasho? Kyatapii Goosuto Kyatapii Hey! Hasamimasho? Goosuto Utsubotto Goosuto Hey! Hasamimasho? Garaara Gyaradosu Garaara Hey! Hasamimasho? Gyaradosu Dogaasu Gyaradosu Hey! 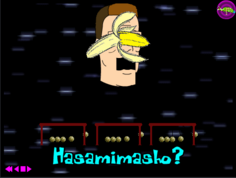 Hasamimasho? Dogaasu Hitokage Dogaasu Hey! Hasamimasho? Hitokage Okorizaru Hitokage Hey! Hasamimasho? Okorizaru Purin Okorizaru Hey! Hasamimasho? Purin Myuutsuu Purin Hey! Hasamimasho? Myuutsuu Kabigon Myuutsuu Hey! Hasamimasho? Kabigon Gyaradosu Kabigon Hey! Hasamimasho? Kondo wa Pokemon Sandwich de asobou ze! Kondo wa Pokemon sando de asobou yo! Life is like a mop! Kondo wa Pokemon sando de asobou ka! Pikachu Kairyuu Pikachu Hey! Hasamimasho! Kairyuu Kyatapii Kairyuu Hey! Hasamimasho! Kyatapii Goosuto Kyatapii Hey! Hasamimasho! Goosuto Utsubotto Goosuto Hey! Hasamimasho! Kondo wa Pokemon sando de asobou ze! This animutation is named for a scene from Weird Al Yankovic's movie UHF, where janitor Stanley Spudowski is made a kids' show host, and gives an inspirational speech where he says "Life is like a mop". One mint per customer ONLY! This is probably the best button to press. So easy, no wonder it's Number A! Never get the words "Life insurance" and "diarrhea" mixed up. The phrase "Wooden Eel" is a reference to the "Space Ghost: Coast to Coast" episode "Flipmode". At the beginning of the episode, Space Ghost is playing Submarine Captain and his ship is "attacked" by "wooden eels" (a stack of wood planks). "Enuresis" (a word that pops up in the animutation frequently), for the curious, is the scientific term for bedwetting. At the end, keep waiting until Aaron Ackerson pops out again. Then stuff will happen. After Mario falls down, click on him as quickly as you can to reveal secret text! Click on the triangle for more text. Keep clicking 'til it says "AAAH! You win!" (117 clicks total), then click once more to watch the animutation again. This page was last modified on 10 October 2009, at 19:09.